The latest edition to the trusted family of Wolmanized wood products, Natural Select wood combines the natural beauty of real wood with a next-generation preservative and a lifetime limited warranty against termites and fungal decay. Wolmanized Natural Select wood can be painted or stained. It is more economical than plastic composites, and it is made from a renewable resource that is treated to last for decades, reducing demands on forests. Natural Select wood is produced by pressure-treatment; it is odorless, and clean to the touch. It can be stained if desired, it undergoes a chemical fixation reaction which bonds the preservative to the wood, and the corrosion characteristics of Natural Select wood are similar to those of traditional treated wood. Traditional treated wood uses CCA copper, chromium and arsenate. Principal ingredients in Natural Select wood are copper and azole. Wolmanized Natural Select wood comes from a rapidly replenished renewable resource grown on managed timberlands. It requires less energy to produce than alternative building products. Its production releases neither air pollutants nor wastewater and the preservative is manufactured in part from recycled materials. A highly durable wood, Cedar can be left untreated in many outdoor applications to weather naturally. If, for reasons of increased wood protection or aesthetics, a finish is desired, Cedarâ€™s freedom from pitch and its high degree of stability make it the best coniferous species for paints, stains, and oils. One of Cedars most valuable characteristics is its well-known high resistance to decay. This comes from the presence of naturally occurring fungicidal compounds in the wood called thujaplicins. Another extractive present in the wood, thujic acid, helps make the wood resistant to insect attack. Like all woods, Cedar is hydroscopic and will absorb or discharge moisture to attain an equilibrium with the surrounding atmosphere. It has a very slow shrinkage factor, however, and is superior to all other coniferous woods in resistance to warping, twisting, and checking. Evidence of Cedars durability are the many Cedar artifacts still in good condition today. Cedar is the preferred wood for nearly all purposes where attractive appearance or resistance to weather is important. 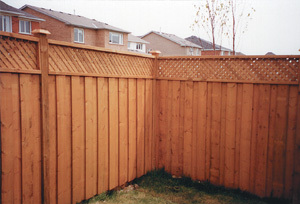 White Cedar is a premier fencing and decking product. The natural preservative oils in White Cedar make it one of the most decay resistant and durable woods in Canada. The supple texture of White Cedar makes it extremely stable and highly resistant to warping and checking. White Cedar is also naturally splinter-free. It is the only wood that naturally weathers to a light silvery-grey colour, while other woods turn a mottled dark grey or black. A sealer can be applied to White Cedar products to stabilize the colour. Free of pitch and resin, White Cedar holds paints and treatments exceptionally well. 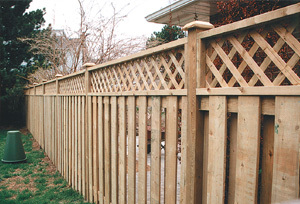 Once you have decided on the type of lumber (Natural Select, Red Cedar, or White Cedar) you would like to use, the next step is to choose one of the many styles of fencing available. o For Privacy, our most popular design is the Good Neighbour, which is identical in appearance from both sides of the fence. It provides privacy, while allowing both sunlight and air to penetrate so that adjacent shrubs and flowerbeds may flourish. o If total privacy is what you require, choose the Estate Style. With this design, the boards are overlapped, one on top of the other, on one side of the fence only. 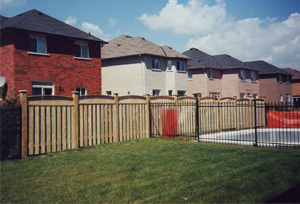 Although this fence may appear to be a traditional Board on Board, or Good Neighbour style, it completely blocks out sunlight and wind while providing superior sound absorption. 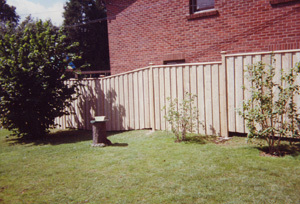 o An economical choice, our Privacy design is constructed with boards nailed side by side approximately apart on one side of the fence only. Like the Good Neighbour, the Privacy allows sunlight and air to circulate so that your greenery flourishes. 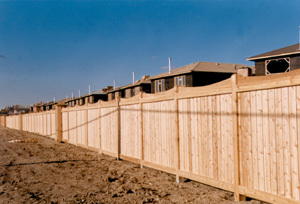 o Decorative perimeter fences constructed with pickets or lattice are also available in a wide variety of styles. This type of fence blends beautifully with shrubs or rose bushes and compliments any landscape design. 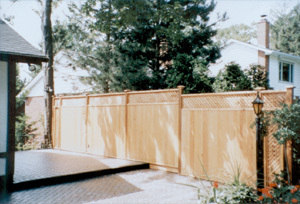 If none of the above styles appeal to you, custom design your own fence with one of our sales representatives by adding lattice tops, scallops, ball caps, or whatever your imagination desires. 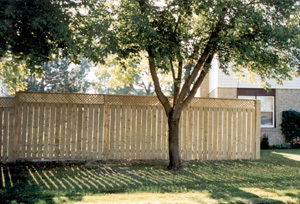 Before we install your wood fence project, property lines must be determined (survey to be arranged by customer). All underground utilities such as gas, hydro, cable, and telephone, must be located prior to the installation of your fence. You can receive a Clearance To Dig by calling Ontario 1 Call, at 1-800-400-2255. Personal utilities (barbecue lines, water sprinklers, electrical lines, etc) must also be clearly marked. Property lines, fence styles, and heights should be discussed among immediate neighbours in order to avoid any complications with the installation of your project. Over the years, we have developed our installation process in order to provide the very highest quality fencing at the best prices. As a member of the CFIA (Canadian Fence Industry Association), we offer top quality materials as well as the best service in the industry.